Thursday began with a keynote from AWS Chief Technology Officer Werner Vogels, who is arguably the coolest person working in technology right now. Werner entered the stage wearing an Autocon Transformer t-shirt and addressed how the AWS platform transforms businesses’ ability to innovate faster and with greater confidence than ever before. Vogels’ keynote included an abundance of exciting technology announcements, which are summarized for you below. AWS Batch will allow developers and engineers to run batch jobs using a service that does not require additional infrastructure to provide scheduling. This service will replace many previously relied on solutions to perform batch-based processing on data and perform automated infrastructure tasks. Systems management has been a consistent pain point for IT organizations. Many customers struggle to address systems management or rely on other solutions to handle systems inventory or manage patching of instances. Amazon ec2 Systems Manager addresses these hurdles in the AWS ecosystem. Sessions were available for a first look at the service on Thursday. It will be interesting to see how this service evolves in the next few months. Customers who love .NET will now also love Lambda. The addition of C# to the Lambda platform will allow .NET developers to write computeless architectures with their favorite language. This is big news for a few of Relus Cloud’s biggest customers. Lambda@Edge is the result of combining Lambda and CloudFront. There are twelve regions where compute occurs and the application has always resided in one of these regions. User interaction with your services must travel across networks to reach the hosting region. CloudFront has more than 50 Edge locations, which are much closer to the end user. Lambda@Edge will allow user interactions with services to occur at the Edge location closer in proximity to the user, instead of half way across the country or the world. The lack of a scheduler has been an ongoing pain point for customers using Elastic Container Service (ECS). Many customers resorted to creating custom schedulers or utilizing open source solutions. Blox provides a collection of open source schedulers and provides a way to implement custom solutions on the ECS platform. An important note here is that AWS is not building their own scheduler, that is not their style. Flexibility is true to AWS form, however, so they have made it easy for you to apply the scheduler that best fits your needs. After two years of remaining quiet about the Build step, AWS finally broke silence and addressed it yesterday. The announcement removes the need to manage the infrastructure to host a Build server. As with all other services in AWS, you only pay for what you use. AWS X-Ray is a new performance monitoring tool for applications. Operations and development can use X-Ray to easily understand the performance of their distributed systems. It will also help with debugging issues in a visual console, making it easier to find and diagnose problems and agree upon the best action for resolution. This service will also encourage proactive continuous improvement activities on customer applications. Personal Health Dashboard (PHD) will allow customers to access a single pane view of the overall health of their AWS environment. Alerts are sent when services the customer consumes are negatively impacted. A Distributed Denial of Service (DDOS) attack on the major Domain Name Service (DNS) providers caused a massive digital properties outage in October. One of the security concerns we hear from customers is, “What about DDOS?” Many organizations have network appliances at the edge to defend against DDOS attacks. So, AWS has addressed this pain point for all AWS consumers. Shield is built into the platform, covers all AWS services, and comes to customers with no additional cost. Step functions introduce a way to coordinate complex workflows of distributed applications and microservices. This exciting service adds machine-state capabilities to Lambda functions. You can now write decision logic between functions. Probably the best-named service announcement of the day, Glue solves the problem of pulling together data sources to funnel them into a transformation pipeline. You can now use this fully managed ETL service to ‘glue’ it all together and gather your analytics faster and easier. Aside from product announcements, Thursday night was re:Play, the unofficial closing ceremony for AWS re:Invent. DJ Martin Garrix was this year’s entertainment provider, continuing the trend of hiring a popular DJ, which began in 2013. If you missed his set, AWS CTO Werner Vogels shared a video from his quality vantage point. As re:Invent 2016 comes to a close, I can’t help but reflect on a great year of innovation. This year’s announcements will be disruptive to both the industry and the partner ecosystem. Innovators love disruption because it drives us to improve ourselves and find new avenues of value in business and the world. This is why we call it: re:Invent. Staying plugged in with AWS innovation? 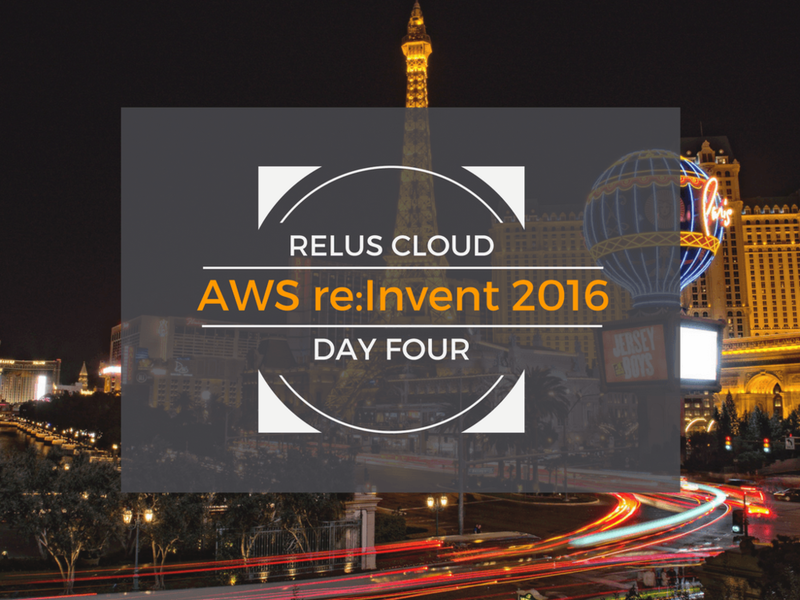 Join the Relus Cloud team for our upcoming re:Invent recap webinar!